Uttapam is always on my menu planner as a favorite morning breakfast. But going through the process of soaking rice, urad dal and then fermenting it sounds like too much work to me. No doubt that is the most authentic way of preparing yummy uttapams, but this shortcut is equally tasty and gives awesome results. 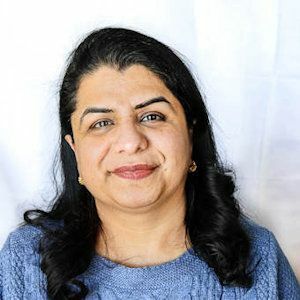 I always have homemade instant uttapam mix ready in my pantry and whenever in mood to have uttapams; I just whisk up the batter and enjoy these yummy pancakes. RATIO IS – 3:1. 3 parts of Rice flour to 1 part of Urad dal flour. I like to add sooji for a crunchy texture but as per taste you can leave sooji out. Simple and easy ingredients, just combine them together and store in an airtight container. 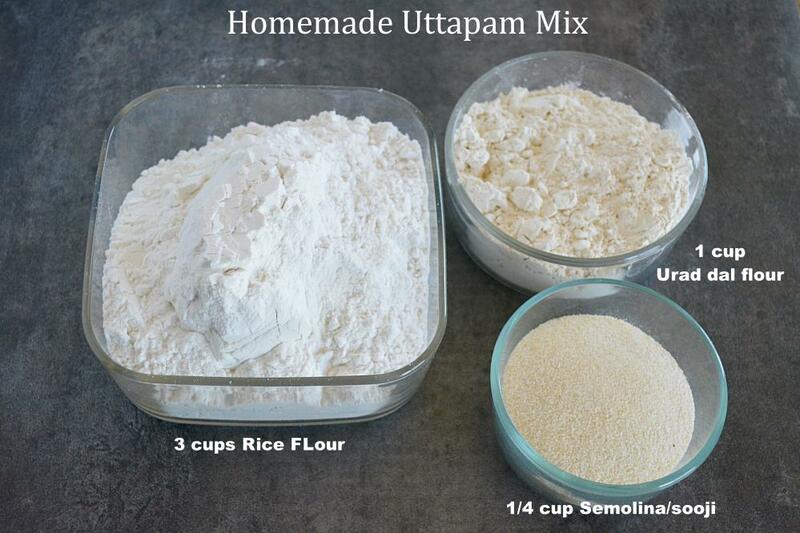 When ready to use take out a desired amount, mix it with buttermilk or water and cook up delicious and tasty uttapams. Enjoy them with your favorite toppings. This uttapam mix does not have spices or salt added, that is something that you would like to add later. For yummy uttapams follow this link. Follow this link to try out other breakfast recipes. Uttapam mix prepared with just three ingredients and enjoy it with your favorite toppings. In a big bowl combine rice flour, urad dal flour.. Mix it well. Homemade Uttapam mix is ready. Store it in an airtight container for future use. Hi….thank u for d lovely recipe. Transfer Urad dal to a grinder/blender and blend until it is ground into a fine powder. I would love to make this mix at home but can I wash the rice and dal first, dry and then powder? Would it keep? Make sure the grains are completely dry before you powder them. Hey i understood about mixing the flours, but do we still have to ferment it or just add water and use it instantly? My child is crazy for uttapams and this homemade instant mix recipe is not only tasty n time saving but also gives me the satisfaction of giving homemade food to my child as i am no longer using the ready mixes available in the market…. Thanks for your kind words MB, means a lot! Hi Ruchi., so these ingredients (Rice flour and Urad flour) , do yu make them yourself or the store bought? Can we also make these at home? Thanks for stopping by Jansi!! I have used store bought rice flour and Urad dal flour. Yes, you can freshly ground them at home, make sure the flours are in powdered form. Hi Thanks for the uthappam mix recipe. Is the urad dal is roasted and then made as flour?. Pl clear my doubt. You are welcome Saraswathy!! Urad dal is not roasted. How lovely. Was looking for such mix for very long. Thanks Ruchi for sharing. Now I have a jar full of this mix sitting in my kitchen. No more GITS uttapams. You are welcome Vanisha. Glad to hear that you liked the recipe!! Have always wondered how to make a good homemade uttapam mix that I can just mix at the last moment and enjoy uttapams. Thanks for the recipe Ruchi, you have made my life so much easier. My mom loved the yummy uttapams.